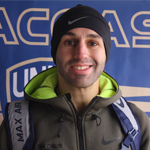 Seth, a New Hampshire native, joins the Seacoast United staff this year. After coaching middle school girls and boys in Haverhill, NH for four years, he became the freshmen boys soccer coach at Exeter High School in 2015. Seth went to Belmont High School and attended the University of New Hampshire. He's currently an eighth grade social studies teacher at Cooperative Middle School in Stratham, NH.